Single chain Fv chimeric receptors, or T-bodies, are described with intracellular sequences comprising the costimulatory signaling domain of CD28 in series with the ζ-chain from the TCR complex. Using an engineered human single chain Fv derived from P67, an mAb with specificity for human CD33, and a spacer comprising an Ab hinge region with either Fcγ or part of the CD28 extracellular region, fusion molecules were constructed to test the ability of single chain designs to mediate both primary signaling and costimulation from one extracellular binding event. Constructs with the CD28 signaling domain proximal and the ζ-chain distal to the membrane were found to express more efficiently in Jurkat than constructs with the opposite orientation and were capable of mediating up to 20 times more IL-2 production on stimulation with solid phase Ag when compared with transfectants expressing chimeric receptors with ζ-chain intracellular signaling domains only. IL-2 production was specific to Ag challenge and was completely inhibited by incubation with free Ab of the same specificity as the extracellular binding site of the construct, but not by an isotype-matched control Ab. The CD28 intracellular domain of these fusion proteins was shown to be capable of binding the p85 subunit of phosphatidylinositol 3′-kinase. These constructs represent the first of a new generation of single gene multidomain chimeric receptors capable of mediating both primary and costimulatory signaling specifically from a single extracellular recognition event. Tcell surveillance in cancer is in most instances critically dependent on the presentation of processed Ag complexed with MHC on tumor cell surfaces. This requirement severely constrains the effectiveness of T cells, as tumor cells down-regulate MHC (1, 2), and potential tumor Ags are not expressed. It has long been the goal of tumor immunology to widen the scope of T cell recognition and to open the entire B cell repertoire of Ag recognition to T cells in an MHC-unrestricted manner. Chimeric receptors that feature extracellular Ab binding sites and intracellular TCR signaling domains, conferring MHC independence on T cell recognition and activation, have shown promise in this area (3, 4, 5, 6, 7, 8, 9, 10, 11, 12, 13, 14, 15). However, there is now substantial evidence that naive T cells require more than one stimulus for efficient activation. Although engagement of the TCR by peptide in the context of MHC is essential for the initial steps of the activation pathway, occupancy of the TCR alone in the absence of other, costimulatory signals does not lead to proliferation of the majority of primary T cells but, rather, induces a state of unresponsiveness or anergy (16, 17). As tumor cells in general fail to express molecules that provide costimulation, the T cell response to Ags presented on MHC by tumor cells is further compromised (18, 19). In accordance with the two-signal hypothesis of T cell activation, chimeric receptors with an scFv extracellular region and a TCR ζ-chain intracellular sequence do not activate naive T cells in transgenic mice (20), in contrast to the ability of similar constructs to activate cells in culture in the presence of high levels of IL-2 (9). Thus, the potential clinical use of current chimeric receptors may be restricted to transduction of ex vivo-derived T cells stimulated with high levels of cytokines for autologous adoptive immunotherapy. A number of molecules with costimulatory signaling capacity in T cells have been identified, including CD2 (21), CD4 and CD8 (22), CD5 (23), and CD28 (24, 25). CD28 in particular has been shown to play a key role in the activation of naive T cells through interaction with members of the B7 family of molecules (B7-1, CD80, and B7-2, CD86) on APCs (26). The short intracellular domain of CD28 serves to initiate a signal transduction cascade, which is distinct from the primary signal delivered by the TCR. On binding of the extracellular domain of CD28 to B7, the intracellular domain of CD28 becomes phosphorylated at the tyrosine residue in a motif that conforms to the consensus amino acid sequence YMXM. This is a member of a subgroup of so-called intracellular tyrosine-based activation motifs that serve to recruit the receptor-specific signaling proteins containing phosphotyrosine-binding SH2 domains. Three molecules to date have been shown to bind phosphorylated CD28: the regulatory subunit (p85) of phosphatidylinositol 3′-kinase, the tyrosine kinase ITK (inducible T cell kinase), and the adaptor molecule grb-2 (27). The mechanism by which ligand binding leads to phosphorylation and recruitment of molecules capable of mediating intracellular signaling is not completely understood, but at least in some circumstances receptor oligomerization may be sufficient to initiate signal transduction. Cross-linking of a chimeric receptor comprising a CD8 extracellular domain and a CD28 intracellular domain led to activation of phosphatidylinositol 3′-kinase and enhanced IL-2 production in Jurkat cells (28). A chimeric receptor (29) similar to those described above, with an extracellular scFv binding domain, but with a CD28 intracellular domain in place of the TCR ζ-chain, has been shown to deliver costimulatory signals similar to those elicited by cross-linking of unmodified CD28 when combined with stimulation via the TCR/CD3 complex. In the same report double transfectants expressing scFv-CD28 and scFv-ζ chimeric receptors, with specificities for different haptens, were shown to produce maximal levels of IL-2 in response to specific Ags. In this paper we investigate the concept of providing primary and costimulatory signaling from a single gene product. We describe single chain chimeric receptors with scFv Ab extracellular domains (30) and intracellular sequences comprising the signaling region of CD28 in series with the signaling region of the ζ-chain from the TCR complex. Extracellular binding specificity for the constructs is provided by the engineered human single chain Fv derived from P67 (31), an mAb with specificity for human CD33, which is currently in clinical trials as a drug conjugate for treatment of acute myeloid leukemia. Spacers are used to distance the extracellular binding domain from the membrane (32) and comprise the hinge region from human IgG1 with either the CH2 and CH3 domains from IgG1 (referred to as G1) (33) or part of the extracellular region of CD28 (referred to as h.28). The primary signaling and costimulatory regions are, respectively, either proximal or distal to the membrane, and the transmembrane sequence is taken from the region proximal to the membrane in either case. Constructs are stably expressed in the human CD4+ve T cell line Jurkat, and the ability of the transfectants to produce IL-2 on challenge with either solid phase CD33 or HL60 cells expressing CD33 is compared. MOPC21 isotype-matched control Ab was obtained from Sigma (St. Louis, MO). Murine P67 Ab (34) was purified from hybridoma supernatant on a protein A-Sepharose column (Pharmacia, Piscataway, NJ). Soluble CD33 was purified by affinity chromatography on a P67 affinity column from supernatant from an NS0 stable cell line generated by transfection with a human CD33 gene genetically manipulated to allow secretion (gift from M. Rolfe). The human cell lines HL60 (premyelocytic) and Jurkat E6.1 (T lymphoblastoma) were obtained from American Type Culture Collection (Rockville, MD) and cultured in DMEM supplemented with 10% FCS, 4 mM glutamine, and 1% penicillin/streptomycin (Life Technologies, Grand Island, NY). Stably transfected Jurkat cell lines were generated by electroporation. DNA was prepared by p500 columns according to the manufacturer’s instructions (Qiagen, Chatsworth, CA), and 30 μg was linearized with SalI before adding it to 1 × 107 PBS-washed Jurkat E6.1. Electroporation conditions were two pulses of 1000 V and 3 μF (Bio-Rad Gene Pulser, Hercules, CA). Cells were left to recover for 24 h in nonselective media. Following selection in 2 mg/ml antibiotic G418 (geneticin, Sigma), transfectants were maintained in the same concentration of G418 for a maximum period of 1 mo. Each component of the chimeric receptor constructs was either PCR cloned or PCR assembled by standard techniques and subcloned in a cassette format into pBluescript SK+ (Stratagene, La Jolla, CA; see Fig. 1⇓, A–E). Diagram of chimeric receptor cloning cassettes. A, P67/G1/ζ; B, P67/G1/ζ-CD28; C, P67/G1/CD28-ζ; D, P67/h.28/ζ-CD28; E, P67/h.28/CD28-ζ. The approximate position of the transmembrane sequence is indicated by a bold vertical line in each construct. Single chain Fv cassette. Leader sequence and VL from the engineered human P67 Ab were PCR cloned with oligos R6490 and R6491. R6490 introduces 5′ NotI and HindIII sites and R6491 forms part of a (Gly4Ser)5 linker. VH was PCR cloned with oligos R6492 (forms part of linker) and R6493 (introduces 3′ SpeI site). Leader/VL and VH fragments were then PCR spliced together, and the PCR product was restricted with NotI and SpeI and subcloned into pBluescript SK+. Hinge-CD28 cassette. Human CD28 extracellular, transmembrane, and intracellular components were PCR cloned from human leukocyte cDNA (Clontech, Palo Alto, CA) with oligos S0146 (introducing a 5′ SpeI site) and P3241 (introducing a 3′ EcoRI site). S0146 also constitutes residues 234 to 243 of human IgG1 hinge. G1 spacer cassette. Human IgG1 hinge, CH2, and CH3 were PCR cloned from IgG1 cDNA clone (gift from A. Popplewell) with oligos S0060 (introducing a 5′ SpeI site) and S0061 (introducing residues L, D, P, and K constituting a 3′ BamHI site). PCR product was restricted with SpeI and BamHI and subcloned into pBluescript SK+. h.28 spacer cassette. Human IgG1 hinge and part of human CD28 extracellular component were PCR cloned from the hinge-CD28 cassette with oligos T4057 and T4058. T4057 introduces a 5′ SpeI site and T4058 introduces residues L, D, P, and K constituting a 3′ BamHI site. PCR product was restricted with SpeI and BamHI and subcloned into pBluescript SK+. TCR ζ cassette. Human ζ transmembrane and intracellular components were PCR cloned from human leukocyte cDNA (Clontech) with oligos R6488 (introducing a 5′ BamHI site) and R6489 (introducing a 3′ EcoRI site). PCR product was restricted with BamHI and EcoRI and subcloned into pBluescript SK+. Human CD28 cassette. Human CD28 transmembrane and intracellular components were PCR cloned from human leukocyte cDNA (Clontech) with oligos P3240 (introducing a 5′ BamHI site) and P3241 (introducing a 3′ EcoRI site). PCR product was restricted with BamHI and EcoRI and subcloned into pBluescript SK+. ζ-CD28 fusion cassette. The 3′ end of ζ, starting at a naturally occurring StyI site, and the intracellular component of human CD28 were PCR assembled such that the ζ stop codon was removed, and an in-frame fusion protein would be translated. PCR assembly was conducted with overlapping oligos: P3301, P3302, P3303, P3304, P3305, and P3306. 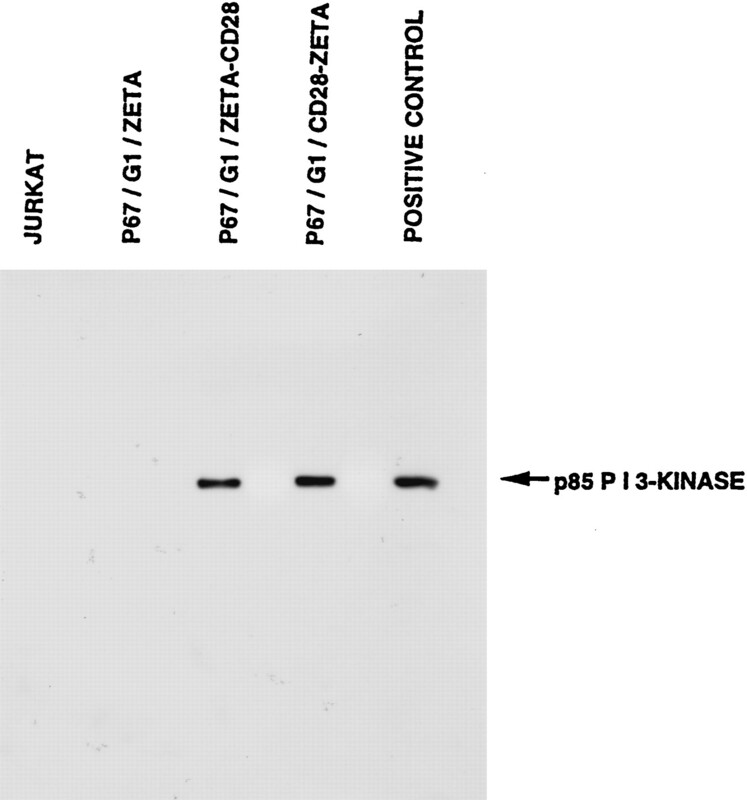 PCR product was restricted with StyI and EcoRI and subcloned into pBluescript SK+ containing the TCR ζ cassette, replacing the 3′ end of zeta. CD28-ζ fusion cassette. Human CD28 transmembrane and intracellular components were PCR cloned from the hinge-CD28 cassette with oligos T7145 and T4060. T7145 introduces residues L, D, P, and K constituting a 3′ BamHI site. T4060 comprises a 3′ overhang compatible with the 5′ end of human ζ intracellular component. The human ζ intracellular component was PCR cloned from the TCR ζ cassette with oligos T4387 and S4700. T4387 comprises a 5′ overhang compatible with the 3′ end of human CD28 intracellular component. S4700 introduces a 3′ EcoRI site. CD28 transmembrane and intracellular components were then PCR spliced to ζ intracellular component with oligos T7145 andS4700. PCR product was restricted with BamHI and EcoRI and subcloned into pBluescript SK+. All of the above cassettes were completely sequenced (Applied Biosystems, Taq DyeDeoxy Terminator Cycle Sequencing, part 901497, Foster City, CA) in pBluescript SK+ before cloning into the expression vectors. All oligos were either synthesized in-house or supplied by Oswell (Edinburgh, Scotland). All oligos are listed in the 5′ to 3′ orientation: R6490, ATATAGCGGCCGCAAGCTTCCACCATGTCTGTCCCCACCCAAGTCCTC; R6491, TGACCCTCCGCCACCTGACCCTCCGCCACCTGACCCTCCGCCACCTGACCCTCCGCCACCTGACCCTCCGCCACCTTTTACTTCTACTTTAGTACC; R6492, GGTGGCGGAGGGTCAGGTGGCGGAGGGTCAGGTGGCGGAGGGTCAGGTGGCGGAGGGTCAGAGGTGCAGCTGGTGCAGTCT; R6493, TATATACTAGTAGAAGACACTGTCACCAGTGT; S0146, CGACTAGTGACAAAACTCACACATGCCCACCGTGCCCAAAAGGGAAACACCTTTGTCCAAGTCCC; P3241, TATGAATTCTCAGGAGCGATAGGCTGCGAA; S0060, CGACTAGTGACAAAACTCACACATGCCCACCG; S0061, TTGGGATCCAGTTTACCCGGAGACAGGGAGAGGCT; T4057, CTACTAGTGACAAAACTCACAC;T4058, TTGGGATCCAGGGGCTTAGAAGGTCCGGAAATAG; R6488, ATATAGGATCCCAAACTCTGCTACCTGCTG; R6489, TATATGAATTCTTAGCGAGGGGGCAGGGCCTGCAT; P3240, TATGGATCCAAGCCCTTTTGGGTGCTGGTGGTG; P3301, GCCACCAAGGACACCTACGACGC; P3302, CCCCCTCGCAGGAGTAAGAGGAGCAGGCTCCTGCACAGTGACTACATGAACATGACTCCCC; P3303, CAAGCATTACCAGCCCTATGCCCCACCACGCGACTTCGCAGCCTATCGCTCCTGAGAATTCATA; P3304, TATGAATTCTCAGGAGCGATAG;P3305,GCATAGGGCTGGTAATGCTTCGGGTGGGCCCGGGGCGGCGGGGAGTCATGTTCATGTAGT; P3306, CTCTTACTCCTGCGAGGGGGCAGGGCCTGCATGTGAAGGGCGTCGTAGGTGTCCTTGGTGGC; T7145, CTGGATCCCAAATTTTGGGTGCTGGTGGTGGTTG; T4060, GCTCCTGCTGAACTTCACTCTGGAGCGATAGGCTGCGAAGTCG;T4387, GCGACTTCGCAGCCTATCGCTCCAGAGTGAAGTTCAGCAGGAGCG; and S4700, TATGAATTCTTAGCGAGGGGGCAGGGCCTGCATG. The cassettes described above were assembled using standard molecular biology techniques to construct chimeric receptors with the specificity of the engineered human Ab hP67, directed against human CD33. The following chimeric receptors were constructed (see Fig. 1⇑, A–E). A) P67/G1/ζ chimeric receptor consists of a single chain Fv linked to an extracellular spacer comprising human IgG 1 hinge, CH2 and CH3, linked to the transmembrane and intracellular regions of human TCR ζ. The single chain Fv consists of the leader sequence and variable component of the light chain of the engineered human Ab linked via a (Gly4Ser)5 linker to the variable component of the heavy chain of the engineered human Ab. The extracellular spacer consists of residues 234 to 243 of human IgG1 hinge, 244 to 360 of CH2, and 361 to 478 of CH3 (35). This is linked to residues 6 to 142 of human TCR ζ comprising extracellular (part), transmembrane, and intracellular regions (36, 37). B) P67/G1/ζ-CD28 fusion chimeric receptor consists of a single chain Fv linked to an extracellular spacer comprising human IgG 1 hinge, CH2 and CH3, linked to the transmembrane and intracellular regions of human ζ fused to the intracellular region of human CD28. The single chain Fv and extracellular spacer and human TCR ζ are the same as in A above. The TCR ζ is linked to residues 162 to 202 comprising the intracellular component of human CD28 (38). C) P67/G1/CD28-ζ fusion chimeric receptor consists of a single chain Fv linked to an extracellular spacer comprising human IgG 1 hinge, CH2 and CH3, linked to the transmembrane and intracellular regions of human CD28 fused to the intracellular region of human ζ. The single chain Fv and extracellular spacer are the same as in A and B above. The extracellular spacer is linked via residues L, D, P, and K to residues 135 to 202 comprising the transmembrane and intracellular components of human CD28. This is linked to residues 31 to 142 of human TCR ζ, the intracellular region (36, 37). D) P67/h.28/ζ-CD28 fusion chimeric receptor consists of a single chain Fv linked to an extracellular spacer consisting of human IgG1 hinge, part of the extracellular region of human CD28, and four amino acid residues, linked to the transmembrane and intracellular regions of human TCR ζ fused to the intracellular region of human CD28. The single chain Fv and intracellular regions are the same as in B above. The extracellular spacer consists of residues 234 to 243 of human IgG1 hinge and residues 118 to 134 of human CD28, and this is linked via residues L, D, P, and K to the intracellular regions. E) P67/h.28/CD28-ζ fusion chimeric receptor consists of a single chain Fv linked to an extracellular spacer consisting of human IgG1 hinge, part of the extracellular region of human CD28, and four amino acid residues, linked to the transmembrane and intracellular regions of human CD28 fused to the intracellular region of human ζ. The single chain Fv and intracellular regions are the same as in C above. The extracellular spacer is the same as in D above, and this is linked via residues L, D, P, and K to the intracellular regions. Full-length chimeric receptor genes were subcloned from pBluescript vectors on a HindIII to EcoRI fragment into the expression vector EE6HCMVNeo, a derivative of pEE6 (39) containing the human CMV intermediate early promoter and the bacterial gene for neomycin (antibiotic G418) resistance. All expression vectors were analyzed by restriction enzyme mapping. Approximately 5 × 105 cells were washed once with PBS plus 5% FCS then incubated with 1 μg/ml FITC-conjugated soluble CD33 at 4°C for 30 min. Cells were washed again in PBS/5% FCS, and expression levels of chimeric receptors were analyzed in a FACScan cytometer (Becton Dickinson, Mountain View, CA). Estimation of the number of CD33 molecules bound per cell was performed using a quantum fluorescence kit for MESF (molecules of equivalent soluble fluorochrome) units of FITC (Sigma QMF10). Jurkat control or chimeric receptor effector cells (1 × 105) were stimulated by incubation on 96-well plates (Nunc Immunol, Naperville, IL) precoated with soluble CD33 titrated from 5 μg/ml in 0.1 M NaHCO3 (pH 9.6), OKT-3 at 5 μg/ml in PBS (pH 7.2), OKT-3, and anti-CD28 (Caltag, South San Francisco, CA) at 2.5 μg/ml each in PBS (pH 7.2) or by coincubation in 96-well U-bottom plates (Falcon, Oxnard, CA) with HL60 target cells at an E:T cell ratio of 1:1 or 1:5. The specificity of effector and target interaction was demonstrated by preincubation of HL60 target cells with 100 μg/ml of either mouse P67 Ab or an isotype-matched control mouse Ab (MOPC21) 30 min before addition of effector cells. After 20- to 24-h incubation in a humidified 37°C incubator, supernatants from cell cultures were harvested and assayed for human IL-2 (Quantikine kit, R&D Systems, Minneapolis, MN). The ability of Fcγ to bind protein A was used for immunoprecipitation. Jurkat control cells and G1 spacer chimeric receptor transfectants were lysed at 6 × 107 cells/ml in a buffer consisting of 1% Nonidet P-40, 150 mM NaCl, 50 mM HEPES, 10 mM NaF, 1 mM EDTA, and 1 mM EGTA, pH 7, supplemented with the following protease inhibitors: 2 mM NaVO4, 1 mg/ml Pefabloc (Boehringer Mannheim, Indianapolis, IN), 10 μg/ml pepstatin, 10 μg/ml leupeptin, and 20 μg/ml aprotinin (Boehringer Mannheim). After 10 min on ice, lysates were spun at 15,000 rpm for 10 min at 4°C. Lysate supernatants were immunoprecipitated for 1 h at 4°C with protein A-agarose beads (Upstate Biotechnology, Lake Placid, NY) equilibrated in lysis buffer. Beads were washed in lysis buffer, and immunoprecipitates were separated by 4 to 20% SDS-PAGE under nonreducing conditions. Gel loading of lysates was adjusted according to relative levels of receptor expression determined by FACS analysis. Ten micrograms of A431 cell lysate, supplied as a positive control with primary Ab (Upstate Biotechnology), was also loaded. Separated proteins were transferred to a polyvinylidene difluoride membrane (NOVEX, San Diego, CA) and blocked overnight in PBS containing 2% nonfat powered milk and 0.1% Tween. The membrane was incubated with primary Ab, rabbit polyclonal anti-p85 Ab (Upstate Biotechnology), then washed extensively in PBS/0.1% Tween; bound Ab was detected with a second horseradish peroxidase-conjugated donkey Ab to rabbit IgG (Jackson Immunoresearch, West Grove, PA). After further washing, signal was detected by a nonisotopic enhanced chemiluminescence assay (ECL assay, Amersham International, Aylesbury, U.K.). Cell surface expression of functional chimeric receptors was determined by FACS analysis after incubation with fluorescent soluble CD33. Figure 2⇓ shows histograms of FL1 signal plotted against frequency for transfectants expressing the five constructs described. Expression of P67/h.28/CD28-ζ was similar to that of P67/G1/ζ, with a median 2000 molecules of CD33 bound/cell. The presence of the CD28 extracellular spacer resulted in greater expression of the CD28-ζ signaling sequence than did the G1 spacer. Constructs with the ζ-chain proximal and the CD28 intracellular domain distal to the membrane gave poor expression in Jurkat transfectants, with <500 molecules of CD33 bound/cell. Surface expression of chimeric receptors. Jurkat transfectants were incubated with FITC-conjugated soluble CD33 Ag before analysis in a FACScan (Becton Dickinson). Figure 3⇓A shows the concentration of IL-2 found in the supernatant of cultures of Jurkat transfectants that had been incubated for 20 h with solid phase CD33 Ag. Untransfected Jurkat cells and cells transfected with the expression vector control produced no detectable IL-2 in response to the CD33. Cells expressing P67/G1/ζ produced 70 pg/ml, while constructs with the costimulatory and primary signaling domains combined on the same protein chain were able to mediate IL-2 production of up to 1600 pg/ml. Again, the h.28 spacer was seen to be advantageous compared with the G1 spacer in fusion proteins with the same intracellular signaling domains. No IL-2 was detected in cultures of transfectants expressing chimeric receptors with the intracellular orientation ζ-CD28 with this form of stimulation. Stimulation of chimeric receptors with solid phase CD33 Ag (A) and HL60 Ag-positive target cells (B). Jurkat cells and transfectants expressing chimeric receptors were incubated for 20 h with appropriate stimulation; supernatants were then harvested and assayed for IL-2 by ELISA. C, IL-2 production by G1 spaced chimeric receptors stimulated with a titration of solid phase CD33 Ag compared with production from cells stimulated with solid phase anti-CD3 and a solid phase mixture of anti-CD3 and anti-CD28 over 24 h.
In Figure 3⇑B the production of IL-2 from transfectants stimulated with cellular Ag is illustrated. Jurkat cells were incubated with HL60 cells expressing CD33 at E:T cell ratios of 1:1 and 1:5. Untransfected Jurkat cells and cells transfected with the expression vector control produced no detectable IL-2 on incubation with Ag-positive target cells. Cells expressing P67/G1/ζ produced 90 pg/ml at an E:T cell ratio of 1:1, but this increased to >200 pg/ml as the number of stimulators increased relative to the number of effectors. The construct that produced the most IL-2 on solid phase Ag, P67/h.28/CD28-ζ, was the most efficient at mediating IL-2 production from cellular Ag. No increase in IL-2 production was evident from transfectants expressing this construct when the E:T cell ratio was decreased from 1:1 to 1:5. Again the h.28 spacer was more efficient than the G1 spacer at mediating IL-2 production. In contrast to results with solid phase CD33, constructs with the intracellular orientation ζ-CD28 were able to mediate IL-2 production of some 100 to 200 pg/ml on challenge with HL60 cells, with this level increasing when the E:T cell ratio was decreased from 1:1 to 1:5. Figure 3⇑C shows the effect of titrating solid phase CD33 on IL-2 production from P67/G1/ζ and P67G1/CD28-ζ. IL-2 levels were maximal for both constructs at CD33 coating concentrations of 5 and 2.5 μg/ml and decreased in each case as the coating concentration was reduced to 1.25 μg/ml and 0.63 μg/ml. Stimulation with solid phase anti-CD3 and a solid phase mixture of anti-CD3 and anti-CD28 was compared with stimulation with immobilized CD33. The amount of IL-2 mediated by P67/G1/CD28-ζ stimulated with solid phase CD33 was more than twofold greater than the level seen when a solid phase mixture of anti-CD3 and anti-CD28 was used. This is in contrast to the threefold underperformance of P67/G1/ζ on CD33 relative to stimulation with anti-CD3 and anti-CD28. IL-2 production could be specifically and completely inhibited in all transfectants by incubation of HL60 stimulator cells with free P67 Ab (Fig. 4⇓). 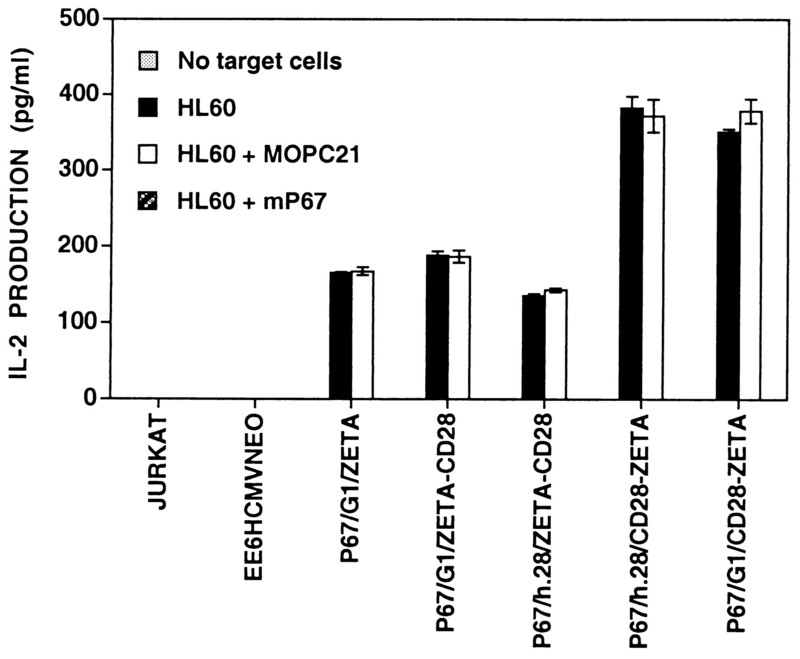 No inhibition of IL-2 production was observed when MOPC-21, an isotype-matched control Ab, was included in place of P67 in cultures of transfectants and HL60 cells. Specific inhibition by free Ab of IL-2 production mediated by chimeric receptors. HL60 stimulator cells were preincubated with either mouse P67 Ab or the isotype-matched control Ab MOPC21 before addition of effector cells at an E:T cell ratio of 1:1. In Figure 5⇓ the presence of the p85 subunit of phosphatidylinositol 3′-kinase is revealed immunoprecipitated with both the G1-spaced chimeric receptors featuring the CD28 intracellular signaling domain, but not associated with the G1-spaced chimeric receptor featuring only the ζ-chain intracellularly. Western blot. Jurkat control cells and transfectants expressing G1-spaced chimeric receptors were lysed, immunoprecipitated with protein A-agarose, and separated on SDS-PAGE before blotting. The membrane was probed with a polyclonal Ab directed to the p85 subunit of phosphatidylinositol 3′-kinase; signal generation was enhanced by chemiluminescence (ECL). The position of the p85 band was defined by a positive control A431 cell lysate. Following the reports of inhibition of tumor cell growth in vitro with a pair of bispecific anti-CD3/and anti-CD28/anti-folate binding protein Abs (40) and successful treatment of established xenografts using an anti-CD3/CD30 and anti-CD28/CD30 combination (41), we decided to use the chimeric receptor approach to try to achieve equivalent activation of T cells. Previous authors (29) have published encouraging results with double transfectants expressing scFv(a)-CD28 and scFv(b)-ζ chimeric receptors, and here we present data from a set of molecules featuring an extracellular scFv Ab binding domain with intracellular CD28 and ζ-chain signaling domains in series on a single chain. Each chimeric receptor was analyzed as a bulk transfection to provide a representative population of many individual transfectants. These cells were selected in the maximum possible level of G418 and maintained in culture for short periods to ensure a consistent expression level. This bulk transfection minimizes influence from individual positional integration effects to allow clear demonstration of differences in performance between constructs. We believe that such transfectants more closely resemble effector populations generated by in vivo targeted gene delivery. Although the expression of construct P67/h.28/CD28-ζ was similar to the level seen with P67/G1/ζ, inclusion of the CD28 intracellular signaling domain in the design led to a 20-fold increase in the secretion of IL-2 from Jurkat transfectants challenged with solid phase CD33 Ag. This increase compares favorably with the 5- to 7-fold improvement reported for the addition of cross-linked anti-CD28 Ab to transfectants expressing chimeric receptors with ζ signaling only (29). When the IL-2 production from transfectants expressing constructs P67/G1/ζ and P67/G1/CD28-ζ, which share the same spacer, was compared, there was a 10-fold increase attributable to the inclusion of the CD28 intracellular signaling domain, less than the 20-fold reported above. However the expression of P67/G1/CD28-ζ was some 50% that of the P67/G1/ζ construct, suggesting a roughly similar contribution from the costimulatory domain in both cases. The amount of IL-2 produced by P67/G1/CD28-ζ when stimulated by immobilized CD33 coated at 5 and 2.5 μg/ml was over twofold higher than the level seen after stimulation with a solid phase mixture of anti-CD3 and anti-CD28 coated at 2.5 μg/ml each. As the concentration of coated Ab was saturating and could be considered to provide conditions conducive to activation through both primary and secondary signaling, the performance of the chimeric receptor is particularly significant. 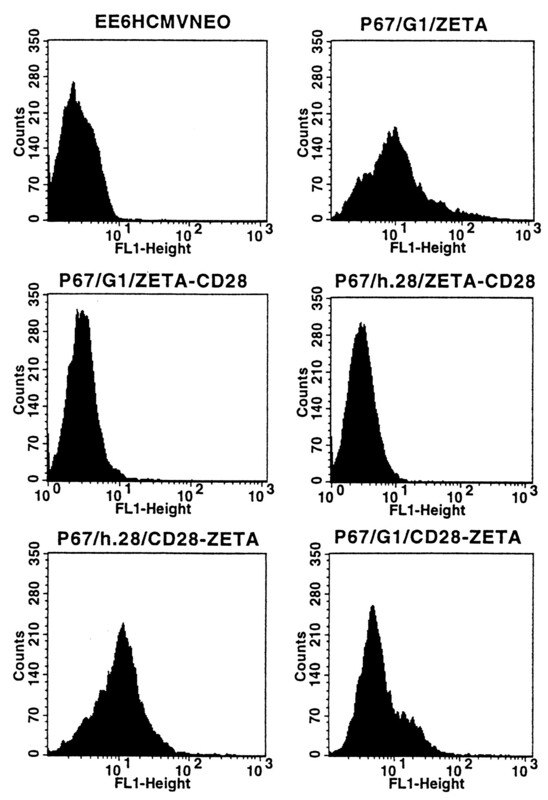 In the same experiment, P67/G1/ζ, which lacks a CD28 intracellular domain, was shown to be at a disadvantage not only in relation to P67/G1/CD28-ζ, but also when compared with stimulation with anti-CD3 mixed with anti-CD28. The threefold underperformance of P67/G1/ζ on CD33 relative to anti-CD3 with anti-CD28 together with the greater than twofold outperformance of P67/G1/CD28-ζ on CD33 relative to anti-CD3 with anti-CD28 provide another clear demonstration of the beneficial effect on IL-2 production of including the CD28 domain in series with the primary signaling region in chimeric receptor design. When HL60 cells were used to provide stimulation for the transfectants, the maximal secretion of IL-2 was fourfold lower than the 1600 pg/ml seen with solid phase CD33 stimulation. This may be due to the lower density of CD33 Ag presented on the target cell surface compared with the saturating coating on plastic solid phases, and it is interesting that IL-2 production from p67/h.28/CD28-ζ could not be increased from HL60 cells as the E:T cell ratio was decreased, suggesting that the density rather than the total amount of Ag used in stimulation is important. The ability of the constructs to redistribute on the surface of Jurkat may be important here (42) and has implications for the design of the transmembrane domain of the constructs and the choice of Ag targeted. However, the increase in IL-2 production attributable to the inclusion of the CD28 signaling domain was at best only 4-fold over the level seen with the ζ-chain chimeric receptor when stimulation was provided by HL60 cells compared with the maximal 20-fold improvement seen above. It would seem possible that other adhesion molecules on HL60 cells are capable of providing limited costimulation to the Jurkat transfectants, partially masking the CD28-mediated secondary signaling (43). The 3-fold improvement in IL-2 production from P67/G1/ζ stimulated with HL60 cells over solid phase CD33 would seem to support this view. The performances of the P67/spacer/ζ-CD28 transfectants on solid phase CD33 and HL60 cells are interesting in this regard, as they exhibit barely detectable expression, produce no detectable IL-2 on solid phase CD33, yet secrete significant levels of IL-2 on stimulation with HL60 cells, implicating reliance on alternative secondary stimulation. This also suggests that this orientation of primary and secondary signaling domains is particularly efficient at mediating signaling, at least from Ag expressed on cell surfaces. The poor expression of constructs with the intracellular sequence ζ-CD28 may be due to partial masking of key residues within ζ that are responsible for providing transport of assembled TCR chains from the Golgi to the cell surface (44). The increase in IL-2 secretion seen when the CD28 intracellular domain was included in the design of the chimeric receptors appears not to be due simply to spatial reorganization of the ζ signaling domain intracellularly, but is due instead to genuine initiation of the costimulatory pathway as judged by immunoprecipitation of the p85 subunit of phosphatidylinositol 3′-kinase. Western blots suggest that the p85 subunit is constitutively associated with the chimeric receptors expressed in Jurkat, although it remains possible that the immunoprecipitation with protein A provides sufficient stimulus for phosphorylation of the YMNM motif leading to recruitment of the SH2-containing signaling molecules. The chimeric receptors described have the ability to form stable dimers through the IgG hinge, which was designed in the spacer region; they may also associate with endogenous TCR complex in Jurkat, so constitutive phosphorylation and association of signaling molecules might be expected. There appeared to be no gross difference in the efficiency of recruitment of p85 between the relative orientations of CD28 and ζ. Although Jurkat cells have proved useful for initial studies with the chimeric receptors described, we are currently evaluating these molecules in primary human CD4 and CD8 T cells, where the contribution from the costimulatory domain might be expected to be more profound. Previously described ζ- or γ-chain chimeric receptors, which provide primary signaling only, require high levels of exogenous IL-2 to demonstrate efficacy in animal models (9, 10, 12). The chimeric receptors described here, which incorporate both primary and costimulatory signaling domains in tandem and mediate greatly enhanced cytokine production, may overcome the requirement for administration of potentially toxic doses of exogenous cytokine in vivo. Combining the two signaling domains on the same polypeptide chain offers advantages over expressing two distinct chimeric receptors, one with a primary signaling domain and a second with a costimulatory signaling domain. The two-receptor approach would probably require different spacer regions to prevent heterodimer formation and would be more difficult to deliver using a recombinant retroviral system. Consistent relative expression of each signaling domain would also be harder to achieve with the two-gene approach. The chimeric receptors described in this paper represent the first of a new generation of single gene products that address the goal of MHC- and exogenous cytokine-independent activation of naive T cells and are specifically designed for in vivo gene therapy. ↵2 Present address: Oxford Biomedica Ltd., The Medawar Center, Robinson Ave., Oxford Science Park, Oxford OX4 4GA, United Kingdom. Kabat, E. A., T. T. Wu, H. M. Perry, K. S. Gottesman, and C. Foeller. 1991. Sequences of Proteins of Immunological Interest. 5th Ed. National Institutes of Health, Bethesda; National Institutes of Health Publication 91-3242.